A common technique in organic chemistry is to determine the melting point of a specimen. While commercial options exist, [kymyst] decided to build one with similar (or better) functionality, and managed to keep it under $100. The basis of his rig is a 60W soldering iron. He simply replaced the normal soldering tip with an aluminum heating block that holds the capillary tubes and temperature probe. Two small fans are used to quickly cool the heating block, allowing fairly quick measurement times. It should be noted that building a project like this one will mean working with wires that carry 220V (or 115V, depending on your country). Please use proper precautions. In case organic chemistry is on your list of ‘to learns’, [kymyst] included a nice writeup of the determination of melting points. It’s a great primer for those interested in learning more. Using this setup, [kymyst] gets readings of ±0.1 °C. He mentions the possibility of adding a webcam for determining melting point automatically, something that would make this system competitive with much more expensive hardware. The last time we saw one of these it used a hot glue gun as the heating element. When working with chemical reactions it may be necessary to test the purity of the components you’re using. This is especially true with hobby chemists as they often acquire their raw materials from the hardware store, garden center, or pool supply. [Ken] figured out how to get around the $500 price tag of a commercial unit by building this DIY melting point test apparatus. 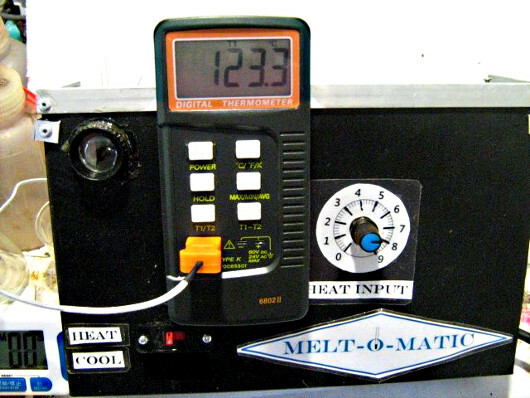 In this image he’s using a thermocouple to monitor the temperature of the melting surface, but mentions that you can do this with an inexpensive dial thermometer and will still have great results. That melting surface is the hexagonal head of a bolt which he drilled out to provide a concave surface for the test compound. Inside the PVC pipe is the heating element from a 40W hot glue gun. He wrapped it in fiberglass fabric which is sold in the plumbing supply to protect the area around pipe joints during soldering. The rotary light dimmer feeds the electricity to the element, allowing for adjustments to the ramping speed.